Oriental Dance workshops can focus on either a complete choreography or on concepts such as: how to create choreography or combinations; how to understand music interpretation; strategies for improvisation; how to dance to live music; folkloric styling versus oriental, and more. 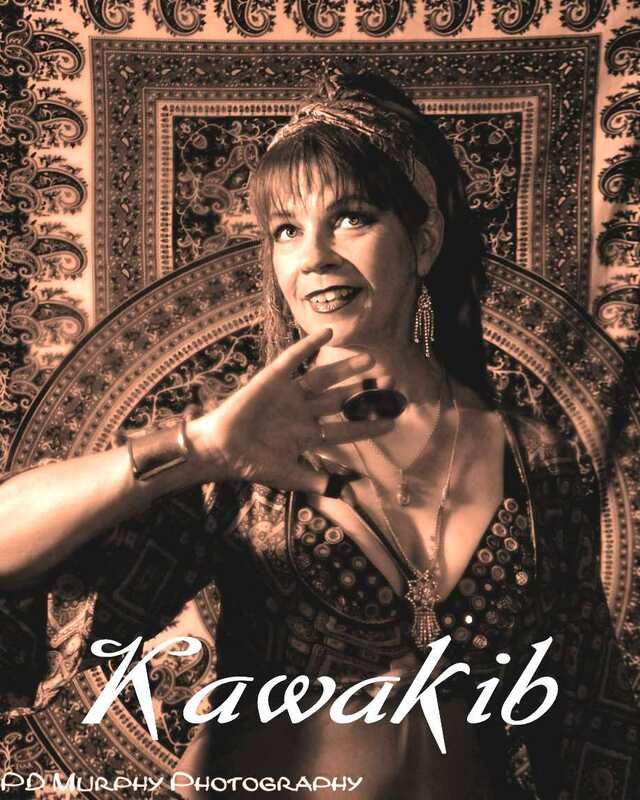 Rhythm and/or Percussion basics for belly dancers; typical belly dance rhythms; how to hear and identify rhythms or count the beat of the music. Speaking engagements for civic groups; demonstrations and cultural education; or learn-to-belly-dance programs and parties. Would you like to learn more about how to understand music so you can interpret it visually? My choreography workshops focus on a particular piece of music, with diagrams showing how to break down the music by rhythm and melody so you understand the concepts behind the choreography. I have many other choreographed dances available to learn that aren't listed here. These classes are 2 - 3 hours. Ba'id Anak: Combinations, concepts for the Entrance, beledi, and taqasim sections that form the traditional Oriental solo; using a short excerpt from "Ba'id Anak" (by Samir Srour), a popular Oriental dance piece. Layali Pop: Music Interpretation and Choreography to a fun hit song; features strong hip action, travel step combos and hip accents. Zeina: A beautiful solo choreography to Hossam Ramzy's rendition of an old favorite explored and broken down; we'll focus on Music Interpretation on a practical level, not just theory. The goal is that you can understand why certain movements and steps are more suitable than others, a MUST for choreographers. Also includes concepts for structuring your improvisation during the taqsim section. Village Dance: Earthy styling to funky Bedouin music "of the Qaria" (village), field recording released by Ibrahim Farrah. This folkloric dance can incorporate cane or sagat. Improvise With Ease! Unlock the mystery of improvisation with tips and tricks, strategies and concepts that help you think on your feet while dancing. You'll hear music in a new way! We'll do exercises using these simple secrets, and take time to answer any questions you have on improvising or hearing the music. Dance Combinations (2 hours) Simple yet elegant Oriental Dance combinations to various rhythms and tempos, including taqasim concepts. Can be adapted for prop dancing (veil, sword, cane, sagat) also. All combinations are listed on my Dance Combinations pages. Advanced level: Dance With Finger Cymbals (2 hours) Intermediate skill level required) Another unique and fun dance. Short but impressive solo dance choreography with finger cymbals - without music! Learn interesting cymbal patterns and distinctive touches, integrated with elegant combinations. Also available to learn online here: Short Finger Cymbal Solo. No one should pay workshop prices for an exercise class! I believe dance workshops should feature dancing, not an exercise routine. So instead of a 30 to 40 minute exercise session, I start my workshops with a short warmup of 10 to 15 minutes, and the warmup relates to the dance moves in the workshop. In fact, the warmup prepares you for dancing by using footstep patterns, arm positions and movements, breath work, self-relaxation techniques; all while relating the movements to the timing of the music. Contact me to discuss your workshop ideas; and for my fee information see Workshop Fees. A brief history of this traditional women's dance of the Mideast; instruction in the basic isolations, movements and foot-patterns (active participation); followed by short performance. Tired of the same old exercise routine? This class starts with a "belly-robics" warmup, then you'll follow me in dance moves to exotic music. I'll show you easy belly dance moves and combinations you can do right away! See why so many women (and men) love belly dancing - it increases your flexibility and muscle tone while you have fun Suitable for all body types.